AWARE Simcoe is pleased to submit comments on the Site selection process for the Organics Processing Facility and Materials Management Facility. We see these new facilities as a necessary step in the progression toward a zero waste economy in Simcoe County. This is a great opportunity for the County to be at the forefront of waste reduction activities provincially, nationally and even internationally and to be a showcase for Zero Waste Management Techniques. The location is virtually adjacent to Highways 11, 400 and 93. Trucks can travel on provincial highways via 400 and 11 from both ends of the County and on County roads from other areas. Other than the required improvements to the entrance to the property there are few road improvements necessary. No doubt these facilities will be of great interest to other municipalities, the waste reduction industry, schools and the general public. Tours will be in high demand. This location is conveniently accessible to the public. Eventual inclusion of the City of Barrie organics and recycling materials into the Simcoe County program seems obvious and inevitable. Locating these facilities in close proximity to the largest urban area in the County makes long term sense. This site has very few residences nearby and is buffered on three sides by Hwy 11, Hwy 93 and the open area to the south (which we believe is zoned EP). The north side is bordered by the church which is an institutional use, not residential. The Napoleon manufacturing plant and warehouse nearby are already similar industrial uses. The main campus of Georgian College is only a few kilometers away in Barrie. This offers a great opportunity to partner with GC to do research into alternative materials for making products and packaging which can be easily and completely recycled. Likewise, this location can be used to do research into uses for the finished compost materials such as urban gardens and soil amendments, in partnership with agricultural groups such as Simcoe County Federation of Agriculture, Christian Farmers Federation of Ontario, Food Partners Alliance and urban garden groups. More than half the property is Canada Land Inventory Soil Class 1-3. Farmland is a valuable resource. This land appears not to be farmed currently. 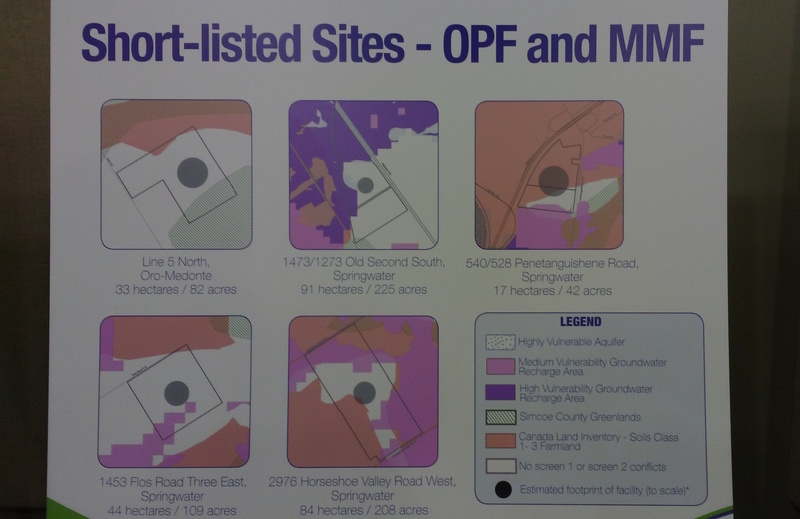 Topsoil will have to be stripped from the footprint area for the OPF and MMF. This topsoil can be used to create urban gardens in cooperation with the urban garden groups in the County and Barrie. The rest of the Class 1-3 land area could be utilized to demonstrate various crop production techniques in partnership with SCFA, CFFO, local urban garden groups and Food Partners Alliance. A small band on the south end of the property is designated as Medium Vulnerability Groundwater Recharge. The southern end of the property can be used to demonstrate Low Impact Development (LID) groundwater recharge techniques in partnership with NVCA and Georgian College. Other portions of the buffer zone areas could be used by the Simcoe County Forestry Department to demonstrate various forestry management and planting techniques, especially the north and south ends of the property. Of course the roofs of the OPF and MMF buildings are the perfect location for solar arrays. Perhaps they can produce enough power to run the facilities. This location offers the opportunity for Simcoe County to provide a showcase for multiple facets of sustainable living and land management going into the twenty first century. 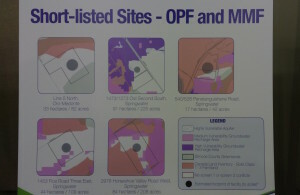 For all the above reasons AWARE Simcoe supports the location of the OPF and MMF at the 540/528 Penetanguishene Road candidate site. during the composting process will there be any attempt to harvest the methane gas produced ?